Our culture of inclusive excellence is rooted in the School’s mission and Core Values. From the moment you become a part of the Latin family, your talents, perspectives and engagement are both welcomed and expected. We embrace the creativity that arises from diverse points of view, honor our students’ rich cultural experiences and aspire to foster a sense of belonging for every member of our School community. The School’s culture of inclusive excellence is shaped by our dedication to providing each student a culturally responsive education. Culturally responsive teaching begins with skilled educators. The School is especially proud of its demonstrated emphasis on attracting the most talented professionals to nurture the next generation of gifted scholars, community servants and global leaders. This includes experienced educators as well as our Latin Fellows. The Latin Fellows program is a new and exciting diversity initiative which transitions aspiring educators from underrepresented groups into the classroom through a co-teaching experience. Teaching critical thinking skills and culturally responsive education are inextricably linked. We view culture as a strength that is useful for increasing self-awareness and consciousness of others. What’s more, we recognize that culturally responsive education – with its emphasis on learning partnerships, deep reflection, and increased opportunities for analyzing issues within the sociopolitical framework – is a perfect mechanism for promoting critical thinking. If you are seeking a high-quality academic experience that honors your child’s individual strengths as part of a collaborative learning community, then you belong at Latin. We look forward to welcoming you to our family. Charlotte Latin School has an excellent academic reputation entrenched in its commitment to educating the whole child, a setting conducive for incorporating institutional principles of diversity and inclusion. 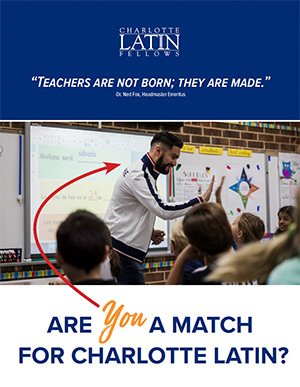 Latin Fellows is a one-year program for recent college graduates considering teaching as a career. Opportunities are available in the Lower, Middle and Upper School. Read the Latin Fellows brochure. Learn more about Latin Fellows. Sonja Taylor is Charlotte Latin’s Director of Diversity and Inclusion. She leads efforts to ensure the School’s commitment to inclusive excellence is exhibited across all areas of the campus. Sonja works with fellow administrators to support departmental and divisional initiatives, with teachers to select appropriate curriculum materials, to apply principles of civil discourse in the classroom and to facilitate numerous professional development and training opportunities, and with families to ensure each person feels a sense of belonging and connection to the School. Taylor was previously at the South Carolina Governor’s School for Science and Mathematics (GSSM), where she was the Diversity Recruitment Manager. Her role included directing all initiatives to attract and retain underrepresented students, building and managing outreach and school district partnerships and collaborating with civil rights, social and community organizations to increase science, technology, engineering and mathematics (STEM) interest and participation among racial minorities. Prior to her work at GSSM, she was a science curriculum writer for CPO Science, in Nashua, New Hampshire, where she wrote physics, chemistry, biology and other scientific content for inquiry-based secondary science education textbooks, created model lesson plans for teachers, and managed curriculum and assessment projects in several states. Taylor was also a public high school science teacher in Attleboro, Massachusetts, and Orlando, Florida, and a chemist at the start of her career at the Flowers Chemical Laboratories. Taylor earned a B.S., in Chemistry from Stephen F. Austin State University, Nacogdoches, Texas, an M.Ed., in Divergent Learning from Columbia College, Columbia, South Carolina, and received an Ed.D. at the University of South Carolina in Curriculum and Instruction with an emphasis on diversity, inclusion and culturally responsive pedagogy. The Office of Diversity and Inclusion is supported by dedicated faculty across each academic division. These educators, along with members of their respective divisional committees, assist the Director of Diversity and Inclusion with multicultural programming, family engagement and support for faculty professional learning experiences. The CLS mission is to encourage individual development and civility in our students by inspiring them to learn, by encouraging them to serve others and by offering them many growth-promoting opportunities. The student-led diversity groups align perfectly with our School’s mission as they raise awareness about issues of inclusion of, respect for, and civility toward all persons across many dimensions of identity. Organizing monthly student learning opportunities. Leading monthly Food for Thought sessions which are open to faculty, staff and students. Participating in team learning experiences including the NAIS Student Diversity Leadership Conference and Affirming Communities Together (ACT) Conference. Assisting other CLS diversity groups, including the Asian Student Alliance, Black Student Alliance and Q & A, which supports LGBTQ students. Renowned author, speaker and thinker, Mark Mathabane, shared his message of respect, empathy and understanding at Charlotte Latin in honor of Martin Luther King, Jr. day at an Upper School Assembly. Mathabane emphasized the importance of global thinking, reading, learning languages and standing up for what is right. Mathabane spent time in teacher and fellow South African Tracey Venneste's Postcolonial Literature class, taking questions from students and telling them to live to their full potential. Complacency and failed imagination are the only things to hold them back. He charged them to step up and speak out — to make a difference at Charlotte Latin School, Charlotte, North Carolina and the world.